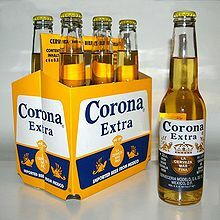 The Beer Circle » American Adjunct Lager, Beer, Grupo Modelo S.A. de C.V., Shenanigans » Corona: With or Without Lime? Dussell is whatever he needs to be. Whether he’s hanging on the wall at Zeno’s or speaking the correct language to a beautiful woman, he always has a beer in hand. He’ll drink just about anything, but really prefers Keystone Light, because like Keith Stone, Dussell is always smooth. *Disclaimer: Our sponsor, AB InBev, does not endorse this reference to a competitor product. The ultimate showdown. 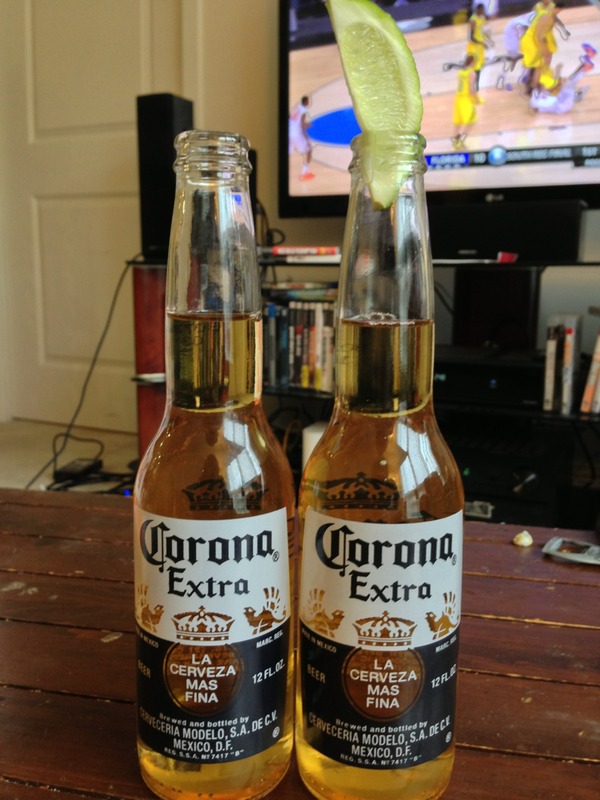 Corona side-by-side: one with lime, one without. When you’re sitting on that warm beach and you reach into the cooler for an ice cold beer, your first question should be: where is the bottle opener? Because clearly you just pulled out a Corona Extra. The second question should be, where are the limes? The two really go hand-in-hand, but should they? Our resident heavy-drinking expert Dussell decided to find out. The beer is crystal clear yellow in the similarly clear bottle. This allows the beer to soak up the maximum amount of sun possible, which is a good thing right? Some bubbles appear after prying off the bottle cap, but otherwise the body is pretty inactive. I didn't pour it into a glass, just seemed like the bottle was the best vessel for this offering. 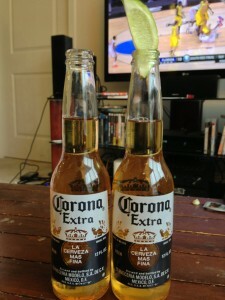 The thin bottle top isn't the best means through which to catch the aroma of Corona, but what I do get is sugary sweet. A little bit of frat basement mixes with how your fingers smell after spilling some sugary juice on them. The slightest bit of beer is in there, too! A taste only a mother could love. Very sugary sweet. Some malty caramel begs for something to balance it out, but all you are met with is stale American Adjunct Lager. Light and crisp, the body is what Corona is known for. It does go down well when you're on the beach, preferably directly after swimming in the ocean and swallowing so much seawater that you can't taste anything else. The finish is really off-putting, otherwise it wouldn't be terrible. A six pack of this import runs around $8, what does it offer over Bud's other American Adjunct Lagers...it's an import! That makes it worth it, right? It really pales in comparison. You really are doing yourself a disservice by drinking this straight. Perhaps if our sponsor takes this beer over they will go the route of Bud Light Lime and monetize this realization! The bottle looks even better with that attractive, vibrant green lime as a hat. The beer explodes to life as the acidic lime drops in, bubbling heavily and yielding a small, fizzy head. This is where the lime really shows its merit. The lime mixes with the sugary aroma to smell like...well...lime juice. But that's better than what it was otherwise. I have to tell you, I am honestly shocked how much better this is with a fresh lime wedge in it. The sugary taste that was begging for balance, finds it with the tartness of the lime. The finish is all lime juice, instead of the stale residual sugar from the regular version. Basically the same as the original, just without that nasty aftertaste. The lime really puts this beer on a different level, whatever that means. A six pack of this import runs around $8, through in a full lime and you're up to $8.50. It's worth the extra few quarters. The clear victor and still champion: Corona with a lime. Our sponsors should really step up their attempts to obtain Grupo Modelo. Why anyone would be against this is beyond me! Last updated by Dussell Becy (Guest Author) at April 1, 2013 . Filed under: American Adjunct Lager, Beer, Grupo Modelo S.A. de C.V., Shenanigans · Tags: American Adjunct Lager, Corona Extra, Corona with Lime, Grupo Modelo S.A. de C.V.